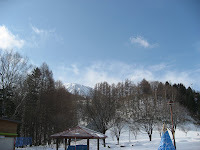 We spent 2 nights at the beautiful Rusutsu Resort . 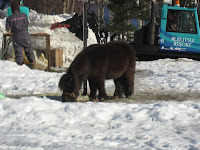 There were numerous ski slopes, a farm, an amusement park with numerous roller coaster rides (which was unfortunately closed during winter), an indoor swimming pool with a 100m long slide as well as an onsen and lots of shops!! 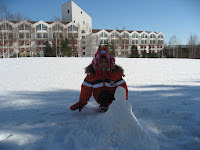 The children did not want to go skiing and opted instead to go sledding. 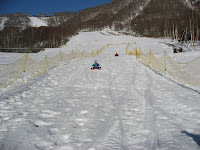 As the slope for sledding was not as high as the ski slopes, there were no chair lifts to bring us up to the top of the sled slope. Next stop was Lake Fukuidashi, where we collected Natural spring water for drinking. 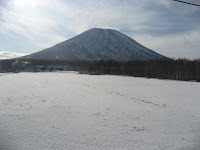 Here, we also had a beautiful view of Hokkaido's "Mt Fuji", Mount Yotei. 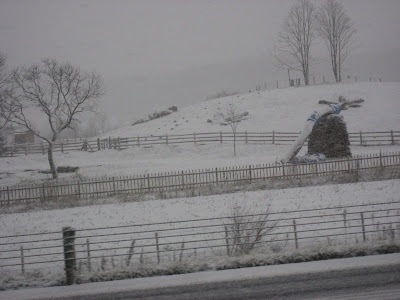 Then we were on our way to Sapporo. We stopped by Otaru Canal, for some shopping around the area. We went to the music box factory where the children could customise their own Music boxes, choosing the designs from whta was available as well as the music they wanted. There were also loads of chocolate shops there. The famous Le Tao, Royce, Hori, etc. No prizes for guessing, we bought heaps!! 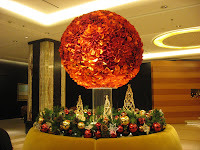 After a long afternoon of shopping we finally arrived at our Hotel in Sapporo , the Sapporo Grand Hotel. 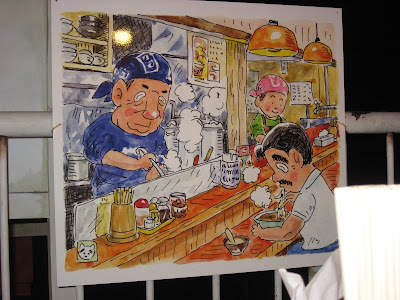 That night we were hosted to dinner at one of the top crab restaurants in Hokkaido. There we were served crab sashimi, crab sushi, crab tonkatsu, crab soup, crab brains, grilled crab, crab chawan mushi, crab salad, crab siew mai. It was another one of those meals - hokkaido king crab everything, that I must have left the restuarant with crabs coming out of my ears. 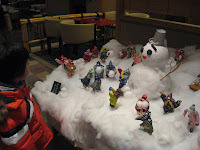 (Little D admiring the display in the crab restaurant). Was I afraid of crabs after that? NO! 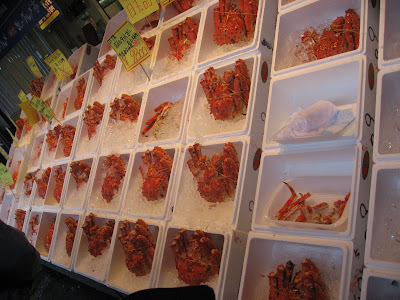 The next morning, we went to a seafood market and guess what I bought? More crabs!! 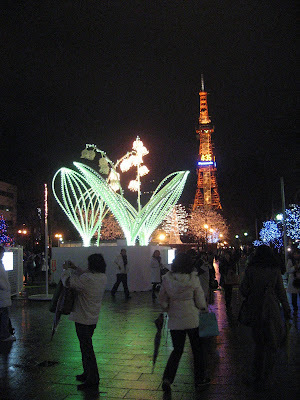 That evening we went for the Sapporo Light Illumination at Odori Park. It was only 4.30pm but look at how dark it was. 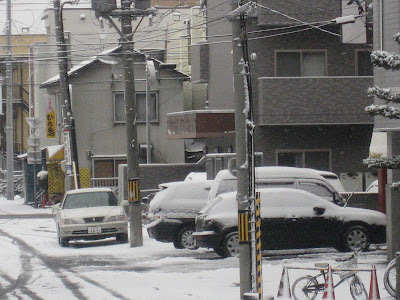 On our last day there, it started snowing again! 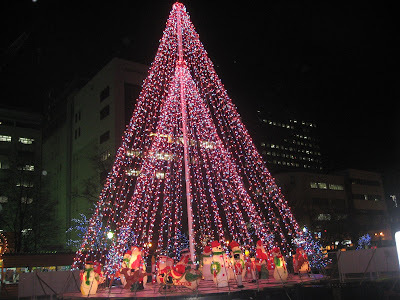 The kids had a wonderful winter vacation, and they are asking for another next year!! Glad the trip worked out so wonderfully for you all, with such lovely memories to last! 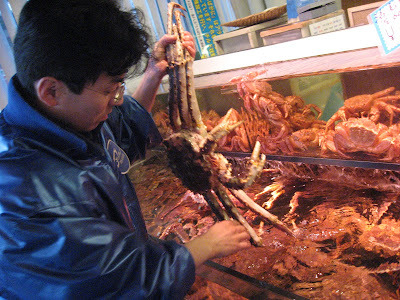 I'm curious... what'd you do with that giant crab... brought it back to the restaurant and they cooked it for your dinner? Yum! I miss black pepper crab! 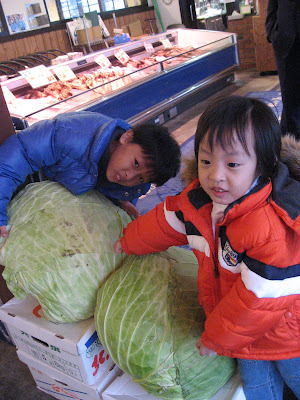 That huge cabbage, on the other hand, would have added $$$ to your excess baggage, haha! Yes Pretzel, we had a wonderful vacation. There's a big hole in the pocket too!! as for that giant crab, we had it for Little D's birthday bbq!! Luckily we had no excess baggage!! We did not buy those cabbages. causes flatulence! Yummm! Your BBQs have me drooling!